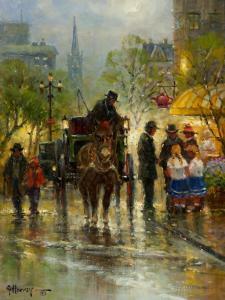 Find artworks, auction results, sale prices and pictures of Harvey T. Dunn at auctions worldwide. 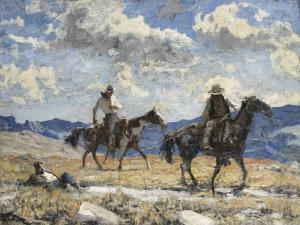 Harvey Thomas Dunn (1884-1952) Two Bays signed and dated 'H - T - Dunn - 06' (lower left) oil on canvas 36 x 24in Painted in 1906. Footnotes Provenance Sale, Jim Fowler's Period Gallery West, Phoenix, Arizona, October 23, 1983, lot 76. Acquired by the late owner from the above. Exhibited Denver, Colorado, KRMA Television, The Cowboy, January 14, 1974. Denver, Colorado, Western Crude Oil Company, May 1975-August 1977. Pueblo, Colorado, Sangre de Cristo Art Center, Artists of the Rockies and the Golden West: Tenth Anniversary Retrospective Exhibition, June-July 1983, p. 28, illustrated. Literature S.H. Mc Garry, Honoring The Western Tradition: The L.D. "Brink" Brinkman Collection, Kerrville, Texas, 2003, p. 8, illustrated. Description: Artist: G. Harvey | 1933-2017 Title: Tea Time in Boston Signed l/l: G. Harvey Medium: Oil on linen Dimensions: 16 by 12 inches Condition Report: Condition: Very Good To the unaided eye, this piece appears to be in very good condition. Inspection under ultraviolet light reveals a normal fluorescence of pigments. There are no signs of damage or restoration. The piece is framed in an ornate dark antiqued gold molding with a stained burl liner, a pale gray suede liner, a dark gray linen liner and a dark antiqued gold fillet. The frame is in good condition with normal signs of wear. Plate: G. Harvey Verso: [handwritten on backside of stretcher bar] #KKED "Tea Time in Boston"; [handwritten on backside of canvas] #KKED "Tea Time in Boston" G. Harvey- Â© GH; [label affixed to backing] The Legacy Gallery, Scottsdale, AZ; [stamped on backing] All Copyrights Reserved by G. Harvey, Ltd. This condition report has been prepared by Altermann Galleries and is no substitute for a physical inspection by you and/or your representative. The report provided by Altermann Galleries has not been prepared by a professional conservator. If you question the condition of a work of art, we recommend you consult a professional conservator of your choice for a more complete assessment. This report will not disclose any condition problems that may occur during the course of subsequent restoration. 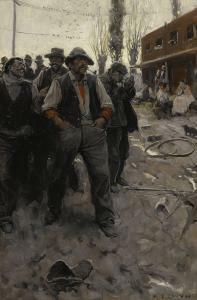 Please refer to Altermann Galleries terms and condition of sale as stated in the auction catalog, or which may be provided to you upon request. All representations and warranties, expressed or implied, will be limited to the conditions of sale. If you require a more detailed explanation of the condition report, which has been provided by Altermann Galleries, please contact an Altermann Galleries representative. A glossary of terms may also be provided to you upon request. All property is sold "as is" and should be viewed personally by you or your professional representative or conservator before the sale to assess condition. Harvey T. Dunn - They Are Giving All / Will You Send Them Wheat? 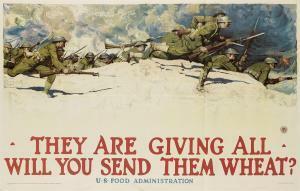 HARVEY DUNN (1884-1952) THEY ARE GIVING ALL / WILL YOU SEND THEM WHEAT? 1918. 36x56 inches, 91 1/2x142 1/4 cm. The W.F. Powers Co. Litho., New York. Condition B+: tape-repaired tear in bottom margin; tears and pin holes in margins; creases along vertical and horizontal folds. Paper. War Posters 138, Borkan p. 61, Theofiles 77. Harvey T. Dunn (1884-1952) "That'll be About Enough, Dusty..." signed with initials in monogram and dated 'HTD/22' (lower right) oil on canvas 30 x 40 in. (76.2 x 101.6 cm.) Painted in 1922. 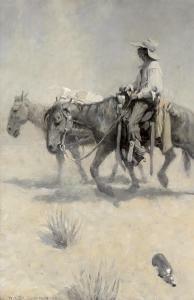 Provenance [With]Fenn Gallery, Santa Fe, New Mexico, by 1979. Judy Goffman Fine Art/American Illustrators Gallery, New York. Acquired by the late owner from the above, 1981.